Having worked in the jewellery industry for so many years now, I am constantly surrounded by many precious metals like Gold, Platinum, Titanium and many more. 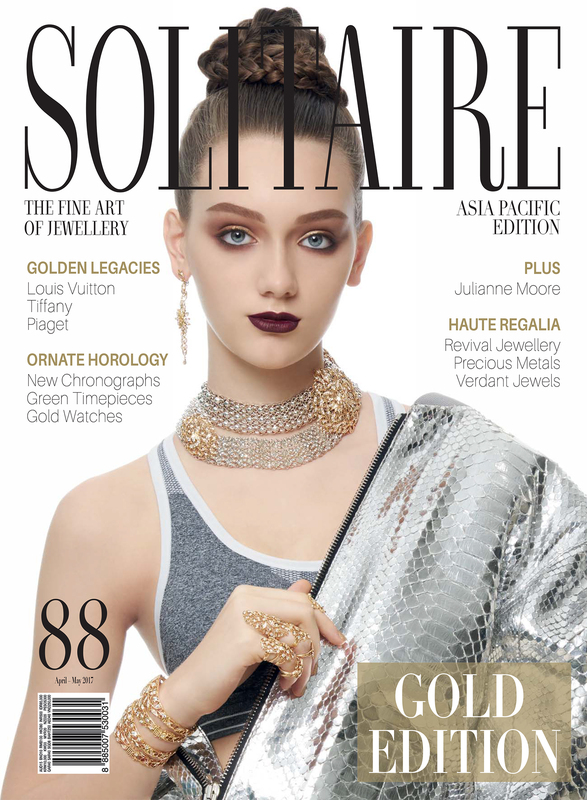 So for my next story for Solitaire Magazine‘s April May 2017 issue, I help you understand the various precious materials used for making jewellery and what differentiates them. Diamonds and precious stones are the centre of attention in jewellery, while the metals which hold the pieces together are usually taken for granted. Yet, those metals are crucial, in terms of both aesthetics and value, and used for jewellery, coinage and bullion. Amongst the 84 known metals, gold, silver, platinum, titanium, and rhodium are royalty, and used for fine jewellery. The most commonly used – of course – is gold, followed by silver. Historians estimate that the practice of gold mining started about 7,000 years ago, and currently, over 2,500 tonnes of gold are mined annually. Standardised trading prices facilitate buying and selling, as is the case for platinum, another popular metal of choice. The matte finished white metal is a lot tougher, denser, and resistant to wear and tear, and therefore a favourite choice for high value products, such as engagement rings. While gold is easy to carve, melt, and mould by hand or lost wax casting, platinum is harder to work on, and can be shaped only by special centrifugal casting methods. The high density of platinum also brings an increase of 30% in weight than gold. At the same time, the strength of platinum has made it one of the most favourite metals by the world’s leading high jewellers. Discovered in 1791, titanium is the latest metal on the jewellery block. Named after the Greek mythology Titans, the metal, when alloyed, is as robust as its name. It is corrosion-resistant, extremely light, and exhibits rainbow colours when heat-treated. Titanium is now being explored by jewellers and watchmakers, and due to its durability and ability to showcase rainbow-like hues of blue, green, and purple, titanium, it is gaining popularity in jewellery design. Silver’s versatility, malleability, and lower price make it one of the most common metals in jewellery. It can be handcrafted to fine detail. However, this favourite metal has a major drawback — it tarnishes. So rhodium plating is used to give the metal an extra lustre, reducing the amount needed for polishing. Rhodium itself is a silvery-white metal and part of the platinum group. It is commonly used to plate white gold and silver jewellery to improve appearance and tarnish-resistance. Surface colours of metals used in jewellery can also be altered with the use of rhodium. One of the most valuable metals around, it is also used in surface treatment technique on jewellery, known as rhodium flashing. 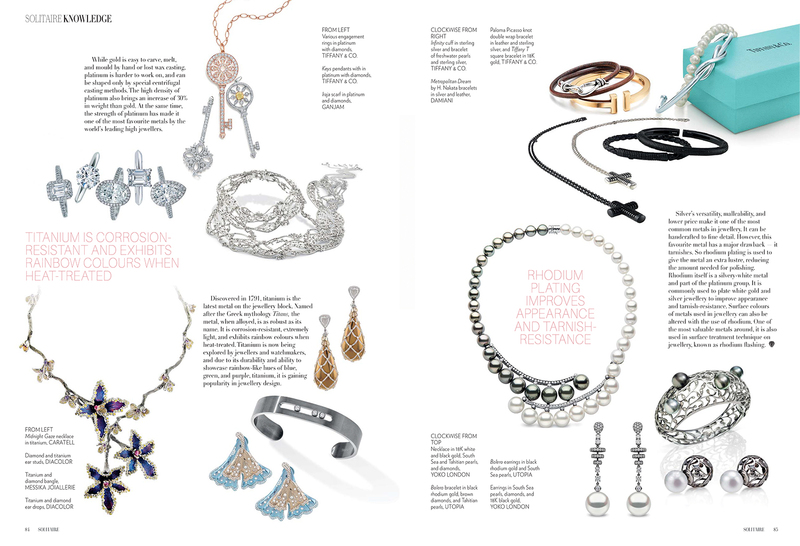 Van Gelder Jewellery: With Love, From India!